Our multi-award winning salon, is a fully air conditioned haven of professionalism, style and quality, providing the very best in hair and beauty treatments and services. All our stylists are trained as Masters of Colour and have a huge talent when it comes to colour and "on trend cutting". As an Advanced Clinical Centre, our Beauty Therapists are also trained to the very highest level. Try our unique Advanced Skincare Facials - using the new Priori Skin Decoded range of products and eliminate all your skincare worries. Chris and Rachel has been absolutely fantastic with me. Chris and Rachel has been absolutely fantastic with me. Got a very good haircut as well as the best colour I have ever had. Altogether very kind and friendly team, would definitely recommend everyone to come and visit. Felt welcomed warmly looked after and cared for the best care possible. Keep up the great work. Any cuts or covering these are the people to come to. This was the first time Chris did my hair, and my plans were a little different than my usual blonde. I told Chris I wanted to go back to my roots, copying my natural hair colour. Without even seeing a photo of my natural hair, both Chris and Chloe went straight to work - they just knew what to do and what colours to use. Chris and Chloe took such good care of me and were able to completely transform my hair. The colour is perfectly matched to my natural root, which nobody has been able to do before. I left the salon feeling absolutely beautiful and radiant. Good experience. Team is really nice, Chloe gave me all the advices I needed and did an amazing job! I am really happy with the result. Thank you !! Used this salon since it opened and have always found the service to be professional and highly competent. Very friendly staff and a relaxed and pleasant atmosphere. 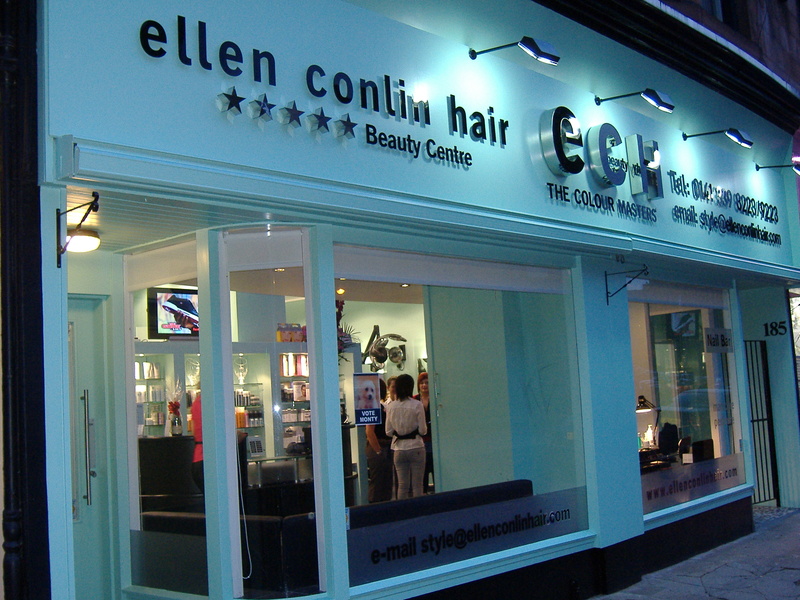 Although I am a regular now at Ellen's I'm treated like a brand new client every time. Chris always makes a fantastic job of my hair colour and cut. I'm so pleased with it. My first visit to the salon and will definitely be back! I am always made to feel very welcome when I walk in here. My treatment with Lorraine was really relaxing. My lashes have been lifted. My brows are beautifully shaped and tinted. After that my treatment continued with Caci. Lorraine takes expert care of all of my face. I am delighted with the result. Thank you. Ryan listened to a slightly over anxcious mother with patience and created a superb cut for my little boy. Couldn’t be happier and will definitely be back. Great job done really love my new style. Welcoming, interested and understanding in doing what you want at the same time haveuseful suggestions. Find the music screens which inc ads don’t add to the ambiance.. totally unnecessary addition to a salon which I would like to chill in ! Check the cost .... £180 cut and colour came as a bit of a shock.... maybe it was the Proseco! Chloe did a wonderful job cutting my twins hair, and the whole team at ECH made us feel very welcome too. Thank you! First time getting a hair cut from here and will definitely be back.